OMFG! The greatest book trailer ever produced. An absolutely brilliant sell job by the folks in marketing/publicity at Penguin USA. Great cinematography, excellent editing, great music, great voice, great tone. Whoever was in charge of making this happen just lapped the field, set the bar and shouldn’t be the one buying drinks until some time in 2010. And why not follow it up with a glimpse back in time to those old, cold days of the Nixon Administration in 1973 when Thomas Pynchon won the National Book Award for Gravity’s Rainbow? Cool little video featuring George Plimpton and the man who accepted the award on behalf of Mr Pynchon, Irvin Corey. 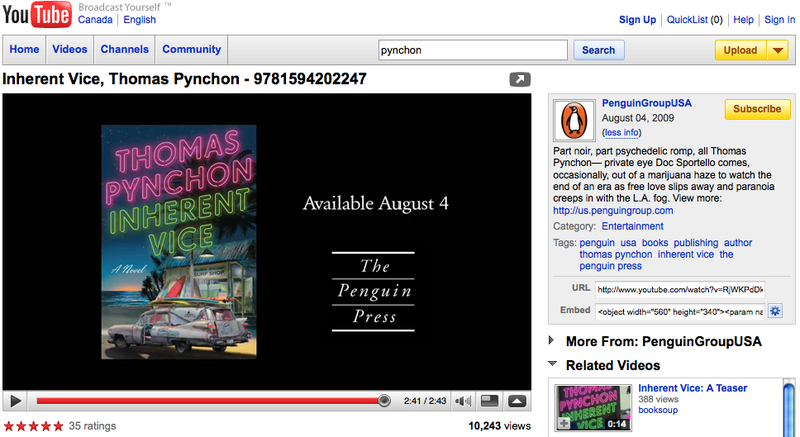 Thomas Pynchon. One of the truly great writers of our time. Have a great weekend. Boyd Morrison is certainly an interesting guy. Not only does he represent the first known instance of a writer completely subverting the traditional submission process for turning a manuscript into a printed work – he went around the slush pile like water around a rock – but he’s also worked for NASA, Microsoft and he’s been on Jeopardy! And he’s an actor. And he lives just a few hours away in Seattle, Washington. All good, as they say. Bronwyn Kienapple brought this up over at Book Ninja earlier today and it’s bound to generate a lot of discussion. If nothing else Amazon/Kindle is looking really good right now while Simon and Schuster may come off looking like geniuses. Or early-adopting opportunists but why split hairs? For his part – from my experience with his website – Morrison seems like a shrewd self-promoter with enough technical expertise, writerly talent and gumption to subvert the traditional publishing acquistions process. A trail blazer, you might say. Both the Ark and another book in the series will be published in hard cover next year. The details of how this happened and who at Simon & Schuster recognized the potential in the author and book is still nebulous. Some details are available at Susan Tunis’ blog and while we’re all waiting for an official story I’m going to try to contact Boyd for a Books on the Radio interview! For people who are interested in some of the meta-details here’s a link to a Kindle discussion board hosted by the author.